Solar power has great potential for the home, however in my opinion it is still not there for the average homeowner. It is just still too expensive for the average homeowner to install and the payback is extremely long. I recently investigated installing a solar power system to my home and was less than impressed with the material and labor costs. There are a couple of websites that actually provide online tools to aid in calculating roof solar panels and associated hardware for your specific home electricity needs/goals. Using these tools, I determined it would take approximately 30-35 years to break even on the investment; however the warranty on the solar power system was around 25 years. In my opinion the ROI is too long, and the warranty needs to be at least as long as the time it takes to recover the costs. Also, solar power systems are not for every home or region. It really depends on where you live and what direction your home faces. If you live in an area that has many cloudy days, or your home’s roof line faces east and west chances are the return on investment will be very low. This all said, Home Depot has recently partnered with BP solar to provide consultation, installation, and follow up inspection services for the installation of home solar power systems. This is a positive sign for mainstreaming solar power to the home, and for bringing the costs of these systems down through mass adoption; however I believe it will still be some time before it becomes affordable for the average homeowner. As part of Home Depot/BP Solar services they will first send a professional solar power systems sales person to your home to calculate your home’s potential solar savings and to determine the best solar power system for your home. Solar power technology for the home is improving and I think it is an excellent complementary source of power to the home. However, prices still need to drop before this market really explodes. 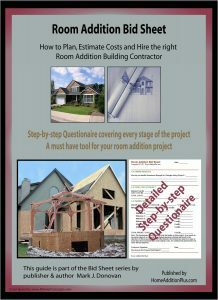 Fill out our 3-5 minute quick and easy form, and receive a free price quote on a home addition from one of our prescreened and licensed home addition contractors. 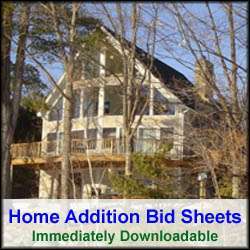 This process is free and there is no obligation to continue once you receive your home addition price estimate.